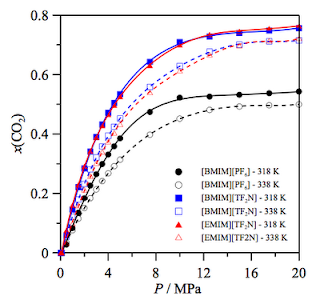 A combined experimental–computational study on the CO2 absorption on 1-butyl-3-methylimidazolium hexafluophosphate, 1-ethyl-3-methylimidazolium bis[trifluoromethylsulfonyl]imide, and 1-butyl-3-methylimidazolium bis[trifluoromethylsulfonyl]imide ionic liquids is reported. The reported results allowed to infer a detailed nanoscopic vision of the absorption phenomena as a function of pressure and temperature. Absorption isotherms were measured at 318 and 338 K for pressures up to 20 MPa for ultrapure samples using a state-of-the-art magnetic suspension densimeter, for which measurement procedures are developed. A remarkable swelling effect upon CO2 absorption was observed for pressures higher than 10 MPa, which was corrected using a method based on experimental volumetric data. The experimental data reported in this work are in good agreement with available literature isotherms. Soave–Redlich–Kwong and Peng–Robinson equations of state coupled with bi-parametric van der Waals mixing rule were used for successful correlations of experimental high pressure absorption data. Molecular dynamics results allowed to infer structural, energetic and dynamic properties of the studied CO2 + ionic liquids mixed fluids, showing the relevant role of the strength of anion–cation interactions on fluid volumetric properties and CO2 absorption.